How to make Aloe vera gel. There are many medicinal uses for Aloe vera gel both internally and topically. Freshly extracted Aloe vera gel is very beneficial and can be used in many ways. Aloe vera is easy to grow or you can buy the whole leaves from various sources. We will now describe how to make aloe vera gel from a freshly cut leaf. Making Aloe vera gel starts with picking a great leaf. The next steps involve carefully filleting the leaf to get as much of the precious gel without the outer skin. If you grow your own Aloe vera the first thing you need to know is how to choose and pick the best leaves. The least bitter leaves are convex rather than concave in the fattest part of the leaf. Many leaves will still be concave as the leaf becomes narrower near the tip and that is fine. Aloe leaves that are totally concave can still be used very effectively topically. The get the optimal nutrition and the maximum amount of gel per leaf it is best to harvest leaves from aloe plants that are 5-years or older. To continually harvest from the same plant you can take off about three leaves every 6 weeks. Cut or pull off the leaf from as low to the base of the plant as possible. This will give you the most gel as possible from each individual leaf. The goal is to harvest as much of the inner clear aloe vera gel without getting any of the outer skin of the leaf at all. To extract the Aloe vera gel, first cut off a small portion of the base of the leaf. (The steps to fillet the Aloe leaf do not have to be done in any exact order.) It is best to cut off the base just above any area that is slightly yellow. That usually means you will cut off about 1-3 inches at the bottom of the leaf. The gel under the yellow section has a high concentration of aloin which is a strong laxative. * Unless you have a specific desire for this laxative effect it is best not to eat the gel from this area. Cutting a small section from the base of the plant also removes any unclean debris and contamination from the bottom of the leaf. Next, cut off a small section from the pointed tip at the top of the leaf. This is done simply to make it easier to remove the outer skin of the leaf. There is generally not much gel at this narrower end of the leaf anyway, so don’t hesitate to cut off as much as you need to make the next step easier. Now you should cut a very small strip along each edge where the thorns are. Cut as little as possible but make sure not to leave any of the outer skin remaining. The skin is very bitter and will ruin the taste of all the gel. Holding your knife at a slightly diagonal angle makes cutting along the edge much easier. Next you can use a fruit and vegetable peeler or a sharp knife and remove the out layer (the skin) of the leaf. Your goal is to get absolutely all of the outer layer but at the same time to remove as little of the gel as possible. It is easiest to remove the skin from the inner side rather than the outside of the leaf. The reason this is easier is that the inner side of the leaf is much less curved. Now you can simply use a tablespoon to scrape the gel from the remaining part of the leaf. It also works to use a thin cake frosting spatula. It has a flat surface with dull edges and works well. Scrape down close to the leaf without actually scraping the fibrous material of the skin. There is no way to do this perfectly but that is not important. You can always scrape a little more remaining gel if you need to. Any undesirable outer leaf you may have scraped up will be easily spotted since the green is clearly contrasted with the see-through clear gel. 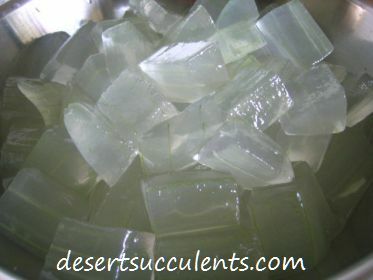 Remove and discard any small pieces of the green outer layer from the gel you have extracted. This may sound complicated or tricky but it really isn’t. 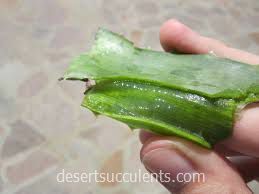 After practicing with just a leaf or two you will find it is very easy to harvest the precious gel from the aloe leaf. How to use Aloe vera. Your question now may be how to eat Aloe Vera gel? The gel may be eaten directly or mixed in other food or drink. It can be used in smoothies along with other nutritional ingredients. It can also be used topically. There are debates about whether freezing the gel will deplete most of the nutritional value. Thankfully, studies have shown that very little of the benefits of Aloe vera are lost through freezing. Ideally, you want to eat or drink it fresh but freezing it and then using it later is the next best thing. Some retail products have used a heat process to harvest the gel from the Aloe vera. Unfortunately, this takes away some of the nutritional health benefits of Aloe vera gel. If you do not have your own plants you may try to find whole Aloe vera leaves being sold at local grocery stores or farmer’s markets. It can also be found on eBay and other online sources. *Aloin is the yellow sap-like liquid that you may see dripping from the leaf you are filleting. We don’t think it is necessary but if you are very sensitive to laxatives or the aloin in aloe vera there is an additional procedure to remove almost all of it. After cutting off the base, the tip and the edges of the leaf soak it in a pitcher of clean water for about 10-minutes. Then after you have successfully gone through the steps to harvest the gel soak that in another pitcher or bowl of water for 10-minutes or so. Both times you soak the aloe vera you may see the water turning yellow. That is aloin that you have leached out with the soaking.